Running back proved to be as enigmatic as usual in week 1 of the 2016 season. Owners were spared the pain of major injury for the most part. Nevertheless, there were some very disappointing performances (Adrian Peterson). Of course there were also surprising fantasy heroes (Theo Riddick). Whichever way your team went, running back depth is always something to strive for. Here are some players that can add to that on almost any team. If you missed out on Ware last week, he is probably rostered for the season. Michael's opportunities will depend on Rawls performance. The Ravens backfield is still an inscrutable mess. Ditto for the Redskins stable or "talent". I love Devonta Freeman, but Coleman is making me sweat. In most competitive leagues Coleman will not be available, but check anyway. He looked very impressive in the passing game (bad news for Freeman owners like me). 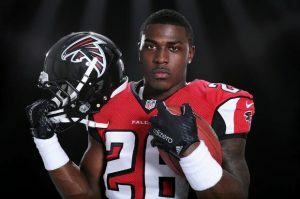 Teams are probably going to game plan for Coleman going forward, but the Falcons have too many weapons to bottle up. For PPR leagues Coleman is especially appealing, but he looks like he should have decent value in standard leagues going forward as well. White is going to be an integral part of the passing game as long as Dion Lewis is on the shelf. After Garopollo's week 1 performance, the Patriots passing game looks to be in good hands. White should be utilized a decent amount on a weekly basis. As with Coleman, White is particularly valuable to PPR owners. The Giants offense is going to be rock solid this year. They are stacked to the rafters with weapons and Vereen is one of the better ones. He is rightfully known as a pass catching back, but Vereen is very good as a traditional runner as well. Opportunity is the one question mark when it comes to the Giants backup running back. Week 1 saw Vereen get a decent number of touches and he turned them into 61 total yards. This does not seem like much, but given consistent touches Vereen can certainly be a useful flex player. The Raiders are very comfortable with Latavius Murray as their workhorse back. After week 1, Washington has not even been the top performer among Raiders backup running backs. He is still worth a stash in case of injury, but in the mean time do not expect much from Washington. There are far too many people wasting a roster spot on the retired Lynch. He has said that he is up in the air about returning to football. This does not make him a valuable commodity. Since his rights belong to the Seahawks, the best case scenario would be joining a jumbled committee. Remember the good times with Beast Mode and let go. No player in the Ravens backfield is pulling away from the pack. Dixon is on the shelf at the moment, but four weeks may not be too long to wait for a back that could take over most of the rushing duties. Still the most talented runner on the roster, Dixon is worth the wait especially in leagues with an IR spot.